JANUARY: We rang in the new year while in St. George, had donut parties in bed, and SURPRISE! Found out we were expecting a little Zurchling. FEBRUARY: Little baby Z got her very first photo taken, we celebrated Valentines day and our anniversary of getting engaged, road tripped it down to St. George for the parade of homes and cousin time. MARCH: Gramma came up for some baby shopping, my tummy started growing, and we found out we were having a GIRL! APRIL: Celebrated our first Easter as a married (& pregnant!) couple, danced and sang in our first apartment, and I passed my finals (barely)! MAY: Celebrated my first Mother’s Day, spent a week in Hawaii for a “baby-moon” and some time in sunny St. George, and E started kicking like crazy! JUNE: Brian turned TWENTY-NINE! we celebrated with a fiesta, and took a few trips to St. George. JULY: We enjoyed-survived-loved-celebrated a year of being married, watched the Met’s play some baseball, chilled at the beach, lit some sparklers for the 4th of July, and partied in Vegas, Mormon style! AUGUST: Maternity pictures were taken, WE MOVED into the house with the white picket fence, had a crazy family reunion, our washing machine flooded our kitchen, we unpacked, and my stomach was HUGE! SEPTEMBER: My grandpa passed away, finished painting the nursery furniture, had a pink baby shower, my due date passed, I showed you the house, we waited (not-so) patiently for baby, I was induced, and BAM we had a baby! Our greatest adventure together. OCTOBER: Travis and Jess got married, E took her first road trip, we had lots of family in town, B blessed Miss Ellie, and we celebrated our first Halloween together. NOVEMBER: I turned 21, Ellie turned two months, I finally shared E’s birth story, and we enjoyed a nice, warm Thanksgiving in St. George. DECEMBER: Decorated our 2nd Christmas tree and managed to keep it alive this year, learned that E loves TV and music, saw the lights at Temple Square, E finally grew out of her newborn clothes, and Ellie had her first Christmas! 2012, you’ve been awfully good to us! looks like a fantastic year you guys had! Loved watching your pregnancy and then Ellie grow! 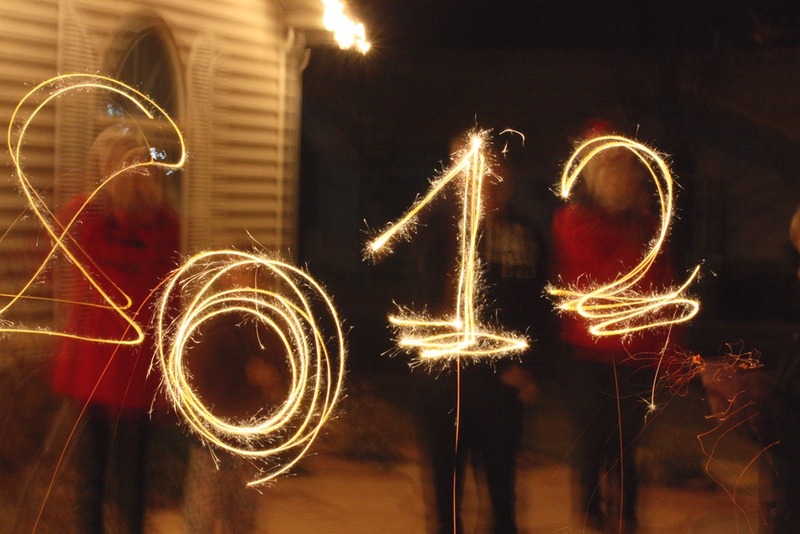 Awww, it looks like 2012 was a most memorable year for you!!! such a cute little family! happy new year! 2012 looked like a great year for you!! This is a really great idea!